Iron Man as seen in the movie Avengers: Age of Ultron. Unique scratching, dust, and flame effects, plus cracked armor! This 6-inch tall limited edition is essential for Iron Man connoisseurs. The Avengers: Age of Ultron Battle-Damage Iron Man Mark 43 Egg Attack Action Figure - Previews Exclusive from Beast Kingdom preserves the original lines of MK43, and the figure's unique matt coating treatment portrays scratching and dust effects on the armor to simulate a vestige of gunpowder after a fierce gun battle. 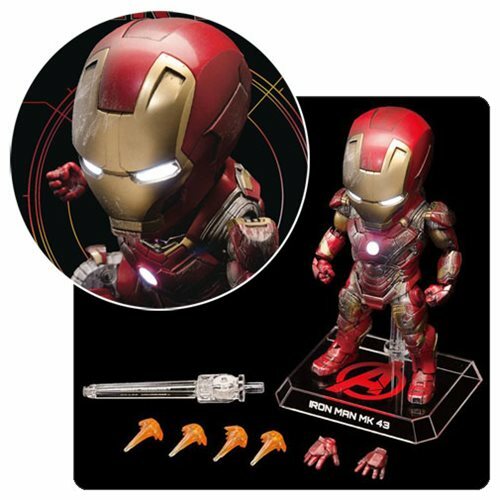 In addition, the cracked armor effect of this battle-damage edition is complemented by a unique flame effect accessory to authentically mimic the appearance of Iron Man in the movie Avengers: Age of Ultron. This 6-inch tall limited edition is essential for Iron Man connoisseurs! Ages 15 and up.